Being a global player spanning the full spectrum of ICT product and solutions, NEC is a reliable and stable partner that combines global scope with local presence in supporting customers and channel partners. NEC Corporation is leader in the integration of IT and network technologies. With over 115,000 employees, global sales of €30B and local presence in 44 countries, NEC’s advanced technologies meet the complex and ever-changing needs of its customers. NEC brings more than 100 years of expertise in technological innovation and invests yearly over €2,2B in R&D across its 12 facilities worldwide, currently owning 74,000 patents. By driving and adhering to widely accepted and deployed industry standards, we ensure that our solutions fit perfectly in existing network environments and offer flexible paths for future development and growth. When designing new applications and advising customers about new solutions we offer a smooth migration path, which protects existing investments to the maximum. Our UNIVERGE®360 approach places people at the center of communications. Based on this vision, we enable organizations to realise business value by tailoring their communications to their specific business processes. Our expertise in mobile technologies and applications and our powerful portfolio of mobile infrastructure and devices, are recognised throughout the industry. Our IP DECT solution, for example, is an innovative wireless solution that combines the advantages of IP telephony with the quality and reliability of DECT technology. We have extensive experience in implementing customised solutions, drawing on our own portfolio of advanced Unified Communications applications as well as those of other industry leaders. In short customers can rely on us when taking the next step towards truly unifying their communications. The dynamics of business today demands efficient, seamless communications to enable rapid decision making and customer responsiveness. To succeed at this accelerated level, businesses must have the right communication tools. NEC provides those businesses with the communications and networking solutions that enable them to succeed. NEC is uniquely positioned to help companies unify business communications and create a competitive advantage. Our UNIVERGE®360 framework ensures that employees - and their roles — determine the best means to get information to those who need it, when they need it, wherever they need it. A key component of this is Unified Communications. UNIVERGE® SV8500 from NEC delivers the promise of UNIVERGE®360 by enabling your executives, knowledge workers, Contact Center agents, operators and both mobile and remote workers to effectively communicate with each other and with customers, channels, suppliers and business partners. It enables your organisation to take a unified communications approach; externally and internally, desktop-to-desktop, by phone, e-mail, fax, wireless, instant messaging or chat via your website. The SV8500 is the premier IP communication server offering an extensive IP feature set in a flexible, scalable, secure package. The system facilitates NEC’s desktop productivity suites to deliver Unified Communications, fixed mobile convergence and advanced collaboration, exploiting rich presence, mobility, instant messaging, attendant console, click-to-call, unified messaging and conferencing. Besides these applications the system supports the full range of NEC endpoints. The need to be more competitive and effi cient is driving organizations to change the way their people communicate and collaborate. Our goal is to connect employees with others and with the information they need. This allows them to make faster, better-informed decisions from anywhere, at any time. UNIVERGE®360 is NEC’s approach to unifying enterprise communications. It provides a foundation for understanding the importance of putting people at the center of communications and reveals how your business needs determine the Unified Infrastructure and Unified Communications necessary for a true Unified Business. Based on role-enabled communication, UNIVERGE®360 accelerates decision-making and dramatically improves customer responsiveness. And, by bringing together business data through a service-oriented architecture, information is instantly accessed and transformed into real knowledge, and thus into empowerment and competiveness. The architecture of the SV8500 is ideal for mission-critical situations and ensures highest availability and business continuity. Besides its flash drive technology for system reliability with a very high MTBF, it provides IP fail-over for stations and trunking, clustered survivability, power failure transfer and call routing for self-healing networks. Advanced fault diagnosis, error-correcting memory, and component redundancy with active/standby all add to the high availability and operational continuity provided. SV8500 system redundancy is supported either as a locally redundant solution (i.e. SV8500 servers reside within the same server chassis) or as a spatial redundant solution (SV8500 servers at different locations). Local and spatial redundancy can be combined as well. In addition to providing high availability, the SV8500 offers users a highly secure system, with advanced end-to-end encryption on voice and signalling streams as well as authentication and authorization. Physically separated interfaces for management and signalling add to the security of the solution. 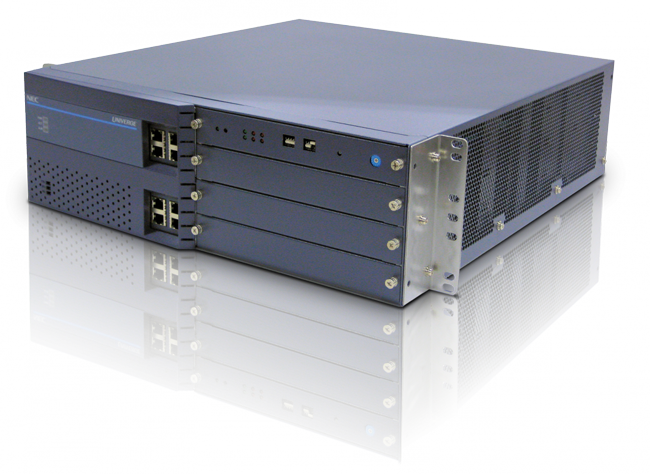 Optionally dedicated SV8500 servers can be located at remote locations. 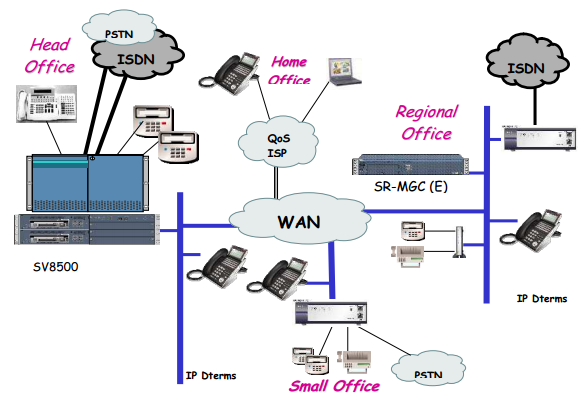 Whenever the connection with the centrally located SV8500 server is out of order, all IP equipment at the remote location can be controlled by the remote server. While IP terminals can still be used for handling telephony calls, remotely installed Media Gateways take care of connecting the remote location with the public network. The Total Cost of Ownership of these remote servers is minimal due to the fact that no operational maintenance activities are required as data synchronization between the remote locations and the central server is completely automated. In order to address both the smaller and larger remote offices, the SV8500 portfolio comprises two types of SV8500 based remote servers, allowing up to respectively 100 and 2.000 IP stations to be controlled remotely. With these two servers an extremely price competitive solution can be offered that is fully tailored to customer specific requirements. The SV8500 provides the most advanced IP communications, including voice, data and multimedia, over one network. Remote locations can be seamlessly linked to share resources and features through peerto-peer connectivity. Multiple UNIVERGE® SV8500 servers can be networked to provide voice, Unifi ed Communications and mobility solutions for tens of thousands of users. The SV8500’s interoperability protects investment in earlier NEC products. Using both FCCS (Fusion) and CCIS networking for seamless integration, the SV8500 can be networked with other NEC products, including the SV8300, SV7000, 2400 IPX and iS3000. Thanks to the ability to accommodate for existing systems such as SV7000 and/or NEAX 2400 IPX systems, the UNIVERGE® SV8500 provides existing customers with an excellent growth path to full IP. Because the UNIVERGE® SV8500 uses the same media gateways, interface cards, terminals, applications and maintenance plans as other NEC systems, customers and partners can reuse components installed and in stock. Existing customers with NEC’s legacy systems will also experience minimal impact to the organization when migratingto the SV8500, thanks to the use of familiar features and programming, avoiding the need for additional training. Migrating to the SV8500 gives you access to expanded features that help you become more agile, compete on a larger scale and improve customer satisfaction. The ability to centrally manage its communication system is of strategic importance to any company, enabling an organization to keep a firm grip on communication costs, reachability and the serviceability of its system. Secure, easy-to-use and robust, our suite of management solutions is designed to increase overall productivity while delivering fl exibility and simplicity. Integrating with your current administration, IT-friendly user interfaces take the mystery out of voice system configuration and administration. Web-based management is provided by the UNIVERGE® MA4000 Management System that enables users to access the system remotely through a personalized portal. To ensure application integration, feature transparency and survivability in the event of network failures, MA4000 can be used to create a geographically distributed unifi ed system with a single image. Additionally, the MA4000 Expense Manager offers the full set of TEM (Telecom Expense Management) applications, such as call accounting, billing, invoicing, mobile management, budget control, asset management, etc. Expense control solutions enhance your organization’s efficiency and cost validation by providing the right tools to effectively manage IT operations and services. Modular architecture lets you expand system functionality, giving you the fl exibility to meet special project requirements and market trends. In today’s economy Unifi ed Messaging is vital. There is no company in business today that does not have some sort of voice-mail and e-mail access, while fax is still a mandatory medium in many financial and legal sectors. With Unified Messaging a user has instant access to e-mail, voice-mail and fax in one portal, wherever he or she is and whatever device used (i.e. phone, computer, tablet or other mobile device). The time required for managing theseUnifi ed Messaging systems is reduced to a minimum due to the high level of integration with the MA4000 system management solution. UM4730 combines voice-mail, automated attendant, text-tospeech, fax functionality and notification into a fully integrated business solution. It includes hospitality integration with more than 20 multi-lingual prompt sets. With UM4730 users may retrieve messages from any location. UM4730 is even capable of sending RSS feeds for new message notifi cations if a user wishes to do so. UM4730 Visual Messaging applications integrate the UM4730 with the desktop to allow control over live telephone traffic and messages. The application conveniently manages incoming and outgoing calls, voice-mail, and faxes all from standard e-mail clients such as Microsoft Outlook, Lotus Notes and Novell GroupWise. UM8700 goes further and provides Unifi ed Messaging with multiple levels of redundancy and support of centralised, distributed or hybrid telephony architectures. It allows to respond to voice-mail and e-mail, schedule meetings and make calls while driving using only voice or to create custom screening rules for incoming phone calls and screen incoming calls in real-time. UM8700 offers a high level of interoperability and works with existing telephone and e-mail systems and data infrastructure. This allows for increasing productivity while leveraging existing investments. With organizations becoming increasingly fragmented, departments more flexibile and employees more mobile, collaboration is a means of enabling them to work together, in real time, and interact effi ciently and effectively with each other, with clients and suppliers. Presence is about being able to share one’s availability status so everyone is aware of it and can act accordingly. Our all-in-one Unified Communications suite Business ConneCT helps unifying an entire organization, enabling individuals, departments and locations to work more efficiently by ensuring seamless internal and external communications. Users can connect from wherever they are via phones, PCs, mobile devices and the web effortlessly. Business ConneCT offers all the advanced communications functionality you need, including call control and group information, voice-mail, directory services, operator and call routing. Simple and cost-effective to deploy, Business ConneCT’s three user modes – employee, operator and contact center agent – use the same server, a single database and with a common user interface, and are managed from a central point. Business ConneCT offers Unified Communications for a really affordable price. Business ConneCT is very easy to use and hardly requires any end-user training. One intuitive user interface shows the relevant items on the screen, depending on your role. Business ConneCT offers tight integration with DECT and other mobile phones. The central company directory is also accessible from DECT, Mobile and Desktop Phones, including presence information. Text messages can be sent to DECT and mobile phone users from anywhere in Business ConneCT. Business ConneCT enables you to improve your business. Business ConneCT Contact Center creates a consistent customer experience with a single point of contact for voice calls and e-mails. Business ConneCT is easy to install and maintain. The installation process is guided via wizards and a System Health screen confi rms that all critical components are functioning correctly. In today’s flexible and fast-moving business environment, employees are never in one place for very long. Organisations may accommodate flexible workspaces and employees need to roam freely throughout the premises. Mobile workers can be just about anywhere: at the office, between appointments, on business travel or working from home. Enabling staff to be mobile provides numerous benefits. Productivity increases, customer service is enhanced and no opportunities are lost due to missed calls. NEC Business Mobility provides a choice of mobility solutions including Fixed Mobile Convergence, Voice over WLAN and IP DECT, powerful applications and a rich choice of wireless terminals and smart phone integration. The Business Mobility Smart Mobile Client solution for FMC provides a sophisticated application on the smart phone, making it a true extension of the SV8500 system. The client provides the user with PBX functionality as well as mobile UC functionality such as presence and central directory. The integration with SV8500 is arranged with a dedicated mobility gateway integrating with SIP and application interfaces. The Business Mobility IP DECT solution delivers on-site wireless telephony combining the benefits of IP technology with the superior quality and facilities of the well established DECT technology. The portfolio comprises IP DECT Access Points that can easily be added to the LAN and can be complemented with Access Points in a remote location. A broad range of IP DECT handsets offer rich functionality like central directory and presence and can be integrated with various applications for alarming, messaging and location services by means of the open interface DMLS (DECT Messaging and Location Services). IP DECT is a very reliable and proven solution. Many thousands of customers worldwide use it in various demanding environments such as in industry, healthcare and hospitality. IP DECT can be used in difficult areas such as with high reflection or where many wireless systems are active. Business Mobility IP DECT provides users with integrated applications as well as applications that can be connected through the open interface DMLS. Central directory provides users access to the company directory, so at all times the telephone numbers and names of the entire organization are at hand. Users can also see the presence of the person they need. With Text and Alarm messaging staff can be alerted about incidents such as a fi re, nurse calls or status of industrial processes. The messaging functionality includes individual messages to terminals, broadcast messages to a group of terminals and confirmation messages by the user. Different priority levels allow staff to differentiate messages. Location Detection can be used by organizations that need to locate people and assets for staff safety, tracking of staff and alarming scenarios such as SOS and man-down. IP DECT offers multi-Access Point based location technology to accurately locate the IP DECT handsets. IP DECT offers a range of handsets with crystal clear speech, loudspeaker and hands free support, seamless handover, high DECT security and seamless integration with the SV8500 platform. This provides users an excellent mobile voice communications experience. The portfolio includes the durable handset I755 and the M155 Messenger, combining telephony and messaging in an extreme compact design. Most handsets can be equipped with a memory card for very easy subscription or replacement of the handset. The UNIVERGE® SV8500 supports the latest range of NEC endpoints, including the UNIVERGE® DT700/DT300 series, with their extensive feature set, XML application support, and revolutionary modular design. NEC’s innovative desktop endpoint design is intended to deliver maximum deployment flexibility. Modularity allows for multiple combinations to fi t any business niche or personalisation requirement. From the front desk, to the conference room, to knowledge workers who spend all day on the phone, to remote workers, to executives, NEC offers options for all your business needs. 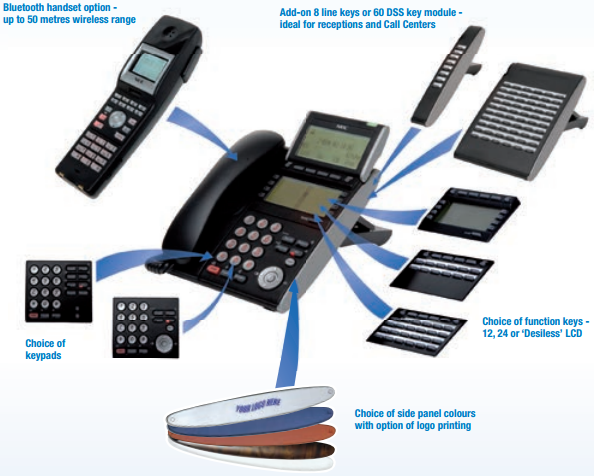 Our UNIVERGE® DT range of terminals and handsets is like no other. Their modular construction means you can chop and change the design for exact business requirements. They can then be upgraded at a later stage without having to replace them – a great investment protection. Feature-wise, time saving features such as company directories, call history and speed dial are instantly accessible. Not only does this improve productivity, it increases customer service levels too. Top end features on the IP phones include colour touch screens and an ‘XML open interface’ which provides integration with Microsoft® Outlook databases and more. In every industry sector, the number of applications which a company utilizes, increases each year. Each application delivers its own set of information, reports, notifications and alarms. Specifically for alarms and notifications, the challenge is how to present all this information in the right format at the right time to the right persons. In a hotel this could relate to the replacement of a malfunctioning remote control within an acceptable time. In a hospital this could mean sending the right medical staff to the right location at the push of an emergency button. In industry it is crucial for an operator to react immediately if the production line is stopped. Communication based process automation increases the efficiency by minimizing process latency and human error. Using MobiCall as middleware, the SV8500 communication solution can integrate with a variety of external applications such as paging systems, nurse call systems, medical alarms, fi re alarms, public community emergency systems, building management and workflow systems. Even further, with the intelligent and rich management interface of MobiCall, adjustment to ANY customer’s specific integration requirement is very easy to accomplish. MobiCall manages all customer alarms, events and inputs received from different customer process and notifies the staff by text or voice messaging to their NEC DECT, mobile client or fixed phone. MobiCall can also send e-mail or SMS, switch on a siren, switch on lights, activate a contact, open or lock doors, inform and escalate any way your enterprise desires. Thanks to close integration of the SV8500 Communication Server, NEC’s powerful mobility solutions and MobiCall, NEC can guarantee timely response in critical events and emergency situations that require real-time feedback, high quality voice calls and correct prioritization of information. Once integrated into the customers’ main business process, NEC equipment becomes the key component for a wide number of a typical company requirements like alarming, mobilization and evacuation, building management, personal protection, emergency call, hotline, crisis management and conference solutions, customer-specific security-related applications etc. Furthermore easy Computer Telephony Integration (CTI) is possible based on a very powerful Software Developer Kit. This CTI application can be interpreted and utilized by 3rd party applications. Nowhere is business process integration more visible than in NEC’s dominance of particular vertical markets. In sectors such as Healthcare, Government, Education, Hospitality, Industry, Services and Retail, NEC offers a dedicated team of experts to define and craft solutions at both small-business and enterprise levels. We here describe what this means for just two of these areas. A robust and reliable telephony system is an essential business tool for hotels. The SV8500 requires little or no maintenance and certainly one that will never let the hotelier or the guests down. Key business drivers for hotels are reducing operational costs and increasing revenue. For example, with automatic call distribution combined with state-of-the-art mobility solutions, you can increase the levels of service provided to guests. And integration with building management systems creates further efficiency, safety and productivity improvements. The SV8500 offers all the basic hotel functionalities needed. Automated wake-up call, message waiting indication, guest voice-mail, and Direct-Dial-In capabilities are just some features which all come as standard. NEC furthermore works closely with the major middleware suppliers. Our communication solutions are tested and proven to integrate seamlessly with many PMS and back office systems. When staff is equipped with DECT terminals, you can use the location detection feature to direct the most appropriate staff members to tasks. In-room phone terminals with XML screens provide a vivid shop window for the Hotel’s restaurant, gift shop, fitness centre or any of additional sales outlets. You can even personalise the displays with guests’ names for extra impact. NEC has used its vast experience to develop an entire portfolio of tailor-made communication solutions for healthcare professionals. Solutions that help optimise staff efficiency and reduce overall costs, while simultaneously improving the quality of care and enhancing the patient experience. For example, our wireless telephony solutions connect medics on the move so that they are always instantly reachable – always ready to provide expertise. Integrated Unified Communications ensures all parties can communicate, collaborate and access the most current information quickly and easily. Fixed Mobile Convergence solutions for when staff is off-site ensuring that people remain fully integrated within the organization’s telephony network. Rich on-site wireless DECT communication and integrated messaging keep mobile practitioners always within reach through a single personal number. Contact center, front desk and web applications provide streamlined multi-media communications and ensure friendly and informative services to all sorts of enquiries. All these applications and solutions are fully integrated with the SV8500 communication server. NEC has always been at the forefront when it comes to technological innovations, many of which are related to environmental protection. Our commitment to innovation drives technology developments and product portfolio improvements which, in turn, contribute to a better environment. These are illustrated by the evolution in enterprise communications from TDM technology to IP telephony, from hardware to software, and from separate voice and data solutions to converged solutions and Unified Communications. The SV8500 is an ecologically sound and compact system that uses 23% less power than previous generations of IP communication servers. User documentation provided in electronic format rather than on paper. Besides leading in green initiatives the reduced power consumption and environmentally-friendly components also deliver lower total cost of ownership. Customers will appreciate the organizational productivity gains the system provides, delivering savings with facilities such as multi-user voice conferencing and softphones, and comprehensive ways to control operating expenses.